Rohit stopped playing with his Lego toys and sat next to me. "What is the story you're going to tell me today, grandma?" asked my grandson. His summer holidays had just begun, and he waited to hear the stories I was going to say. I thought for a moment, and said, "Rohit dear, are you interested in the stories about Indian kings?" "Of course, grandma. I'd love to hear them." "Okay. I'll tell you the story of Ashoka the Great." Who was Ashoka the great and What did he do? Ashoka the Great was the emperor of India." I began the story. "He was one of the greatest emperors known to history. Acknowledged as the greatest of monarchs in world history, Ashoka was singled out as a ruler without a parallel. He was the ruler of Mauryan Empire during the period 273 BC to 232 BC and was also called as Samrat Ashoka." 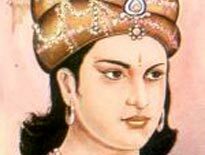 Ashoka was born in 304 BC in Pataliputra, Patna. His parents were King Bindusara and his low ranked queen Dharma. Dharma was also known as Subhadrangi and was the daughter of a poor Brahmin. Chandragupta Maurya, the founder of Mauryan Dynasty, was his grandfather. Though Asoka was the only child to his mother, his father had other sons from his other wives, and they were Ashoka's half-brothers. In Sanskrit, Ashoka means without sorrow. Asoka was an extremely brilliant, but short tempered and fearless boy and proved his ability to become a powerful warrior at an early age itself through his exceptional valor, skills and courage. Being a prince, he got a royal military training. His father Bindusara died in 272 BC, and as per the king's wish, his eldest son Susima was supposed to become the next king, but he was more arrogant to the ministers. Therefore, the ministers preferred to make Ashoka the next king of the Maurya Dynasty, and Ashoka succeeded to the throne in 273 BC. At the age of 18, he was appointed as Viceroy of Avanti and had its capital in Ujjayini. His half-brother Susima, the eldest son of Bindusara, was the Viceroy of Taxila where a revolt broke out in 279 BC and he could not suppress it. Ashoka was called at this time to Taxila and he was successful in suppressing it. Taxila was a center of Vedic culture and Buddhist learning." "Where is Taxila, grandma?" asked Rohit, interrupting me. "Presently, Taxila is in Pakistan," I said and continued my story. "Ashoka married Vedisa Mahadevi Sakyakumari, and the couple had a son called Mahendra and a daughter called Sangamitra. He was very ambitious and cruel, which earned him the name Chand Ashoka, meaning brutal Ashoka. Using his military strength, the territory of Ashoka's empire covered from the Himalayas in the north to the River Pennar (North Mysore) in the south, from Hindukush in the northwest to the Brahmaputra in the east, and included Kabul, Kandahar, Herat, and some parts of Kashmir and Nepal. However, his reign is considered to be one of the most prosperous times in Indian history. In 260 BC, Emperor Ashoka waged a war against Kalinga (which is the present state of Odisha). No doubt he won the war and conquered Kalinga, but it was a destructive war killing and injuring several thousands of people. But the blood shredded war changed his mind completely and repented for his cruel action and he felt responsible for the loss of lives of so many fellow human being. In 263 BC, he gradually converted to Buddhism, which stood for peace and non-violence. He pursued the policy of extending friendship to all the nations. In the later years, he sent his children Mahendra and Sangamitra to Ceylon (the present Sri Lanka) to spread Buddhism outside India. He also built thousands of stupas and viharas throughout the country for the peace and welfare of the people and became a noble preacher of dharma. Among them, The Pillar of Ashoka at Sarnath in the State of Uttar Pradesh, erected by Emperor Ashoka in 250 BC, is the most famous. 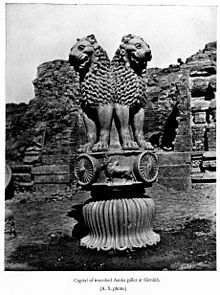 This Pillar of Ashoka is the National Emblem of India. Emperor Ashoka is remembered even today for the service he did to Buddhism, and his name still shines like a bright star in the history of India. His good deeds earned him names like Dharmaashoka meaning the Pious Ashoka, Devanampriya meaning the beloved of the Gods, Priyadarshi meaning one who regards everyone amiably. After ruling almost 38 years, Asoka the Great died at the age of 72, and Mauryan dynasty came to an end. We came to know his work through the many edicts (rock inscriptions), left in various places." Want to learn more about Samrat Ashoka?